511 Tactical 568920191SZ, 568923281SZ RUSH 12 Backpack (56892) FREE SHIPPING! Sized for users on the go, the RUSH 12 Backpack from 5.11 Tactical is ideal for use as a go-bag or for commuting, quick trips and even as a carry-on bag. Its spacious main compartment features a padded sleeve for securing laptops and tablets or can be used to integrate hydration systems up to 60 ounces. A large front admin pockets is loaded with organizers, elastic straps and mesh pouches for keeping small items and loose gear organized, secured and easily accessible. Another front pocket is felt lined to protect glasses, phones and other sensitive items from scratches. Once all 1296 cubic inches of storage spaced are used, external compression straps and an extensive webbed grid provide attachment points for additional modular accessories. All closures are sealed with self-repairing YKK zippers to guarantee smooth operation in any environment. 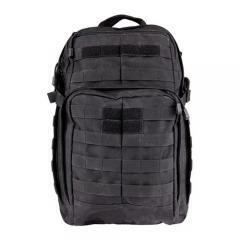 ©2002-2019 CopsPlus.com: 511 Tactical 568920191SZ, 568923281SZ RUSH 12 Backpack (56892) FREE SHIPPING!